Snap Inc (SNAP) surges about 15% in the extended-hours after narrowing its Q4 loss to 4 cents per share versus the estimated loss of 7 cents per share. Revenue increased 36% to $390 million, surpassing the estimated revenue of $376.6 million. However, the number of users stayed flat for the fourth quarter. Daily active users count stood at 186 million in Q4 2018, compared to 187 million in the prior year quarter and 186 million in the third quarter of 2018. Average revenue per user rose 37% year-over-year to $2.09. For the first quarter of 2019, revenue is expected to be $285 million and $310 million, representing a growth of 24-34% compared to Q1 2018. Adjusted EBITDA is expected to be between $(165) million and $(140) million, compared to $(218) million in Q1 2018. 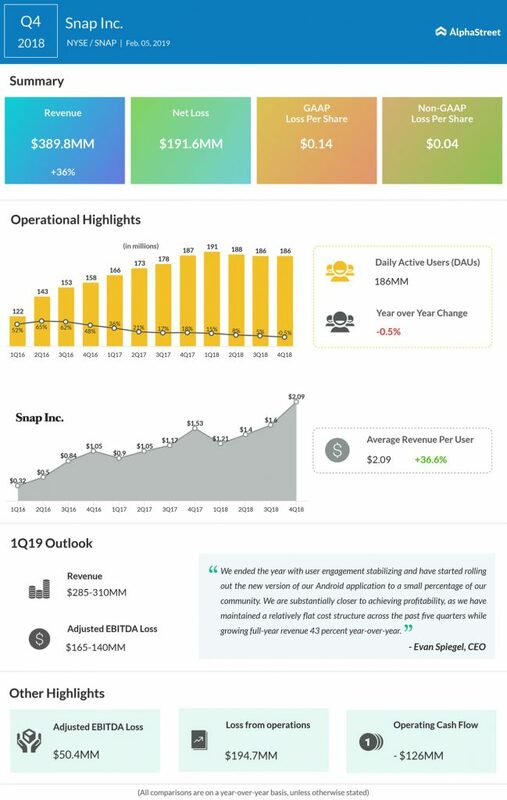 Even though the company didn’t give specific guidance on daily active users, Snap is confident of not experiencing a sequential decline in daily active users for the first quarter of 2019. “We are substantially closer to achieving profitability, as we have maintained a relatively flat cost structure across the past five quarters while growing full-year revenue 43 percent year-over-year,” said CEO Evan Spiegel. Strengthening international offerings and continued product innovation had helped social media company to report strong results for the quarter. The Santa Monica, California-based company ended the year with user engagement stabilizing and started rolling out the new version of Android application to a small percentage of the Snap community. On January 28, Snap appointed Lara Sweet as interim CFO as the company announced Tim Stone’s departure as CFO. Sweet recently served Snap as Chief Accounting Officer. Snap has also initiated a search for a permanent CFO. Social media peer Twitter (TWTR) is set to release its fourth quarter earnings on Thursday, February 7 after the market close. Shares of Twitter closed on Tuesday at $34.37, up 1.37% and extended the gain during the after-market session also. Snap stock, which plunged to a yearly low ($4.82) on December 21, 2018, had a bullish run so far this year and was up 24%.